Would you like more printable and digital freebies? Well take a look at yet another of my favorite websites. This one is card-making-world owned by Adele and is well worth a look. 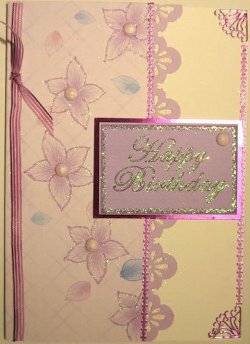 Here you will find many different toppers for your cards as well as backing sheets, images and sentiments. There are also areas for you to add your own stuff, pictures and videos, as well as informative pages for recycling and learning how to use Paint Shop Pro. These pretty "Happy Birthday" labels are in several colours, and two sizes and are very useful to have when you're writing is a scruffy as mine. Just download them to your PC and print them off whenever you need them, then glitter them up and hey presto! a lovely addition to your cards. You will find colored images to print off for all your card making needs ... like Christmas, Easter and Valentines Day to name a few. Many of them are ready colored so you can just print them off and add them to your cards designs immediately. Have a browse around and see what you can find. There you will find VIP membership to Adeles' club where every three months you can take part in a trolley dash to buy loads of goodies..... cheap! And if you're really into selling your cards she has a commercial use section for you to enjoy full of helpful tips on what to do to get the most from this aspect of cardmaking. But take a look at the Resources page for other places to get Digital Freebies and these can all be mixed and matched together and so give you an endless supply of characters and items to work with. Have fun with your crafting and make this the best hobby you have ever tried. You will also find some free backing papers that I have tried my hand at designing and they are there for you to use whenever you wish.